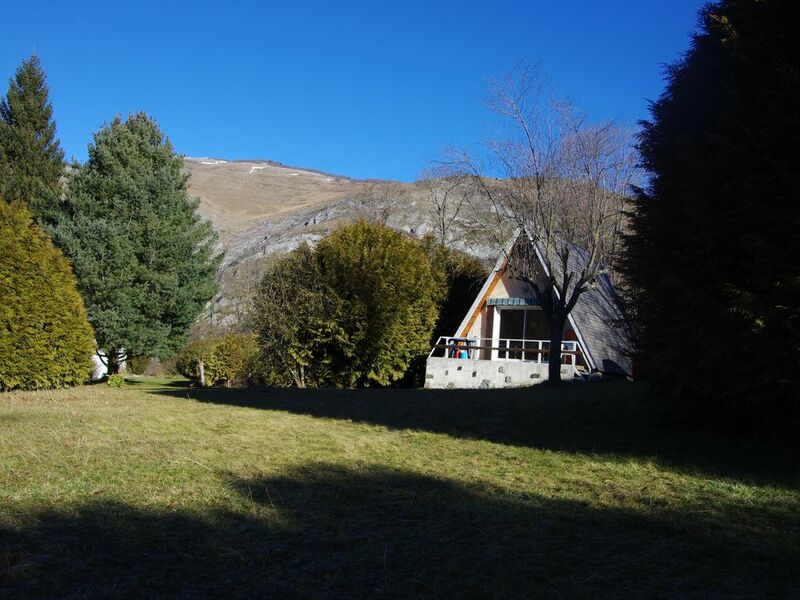 Chalet located in a beautiful meadow, classified 3 keys. Any comfort for 5 people with full kitchen equipment, bedding new condition, TV with Freeview, dishwasher. Living room, kitchenette, bathroom with toilet, 2 bedrooms, 1 mezzanine. Outside barbecue, playground, covered parking place. Comfortable cottage in the countryside in the heart of the authentic campan valley, in a preserved meadow of 6000m2, bordering the river adour. Stunning views of the surrounding countryside and the Pyrenean mountains, at the junction of the mythical Aspin passes and the Tourmalet. You can enjoy this charming mountain chalet recently classified 3 keys, tastefully decorated and fully equipped. Main tourist attractions very close: Bagnères-de-Bigorre, its baths, its market, its market. Situation très agréable de ce chalet confortable et bien équipé. Nous reviendrons certainement. Nous avons apprécié l'accueil d'Annick et sa disponibilité. L'auberge des 2 cols nous a régalés, pensez à réserver. Prévoir ses produits et petit matériel d'entretien. SEMAINE DU 18 AU 25 AOUT 2018 , SEJOUR TRES CALME ET AGREABLE DANS CE PETIT CHALET MENTION TRES BIEN POUR L'ACCUEIL PAR ANNICK POUR SA GENTILLESSE ET SA DISPONIBILITE . NOUS RECOMMANDERONS CETTE LOCATION ET NOUS REVIENDRONS A STE MARIE DE CAMPAN . Merci infiniment pour votre appréciation qui nous ravie. Nous nous efforçons de vous apporter un séjour des plus agréable et vos compliments nous incitent à continuer dans ce sens. Je comprends votre problématique mais, dans les conditions de location, il est bien précisé que votre arrivée se fait à partir de 16h. Chalet fonctionnel, propre, facile d'accès. Bon accueil. Très bien pour un petit week end au ski! I am happy to welcome you in a chalet just 200 meters from the village of Sainte Marie de Campan, on the Adour river for the fun of fishing or just a relaxing foot in the water. The variety of the design of its holes, natural undulation and the magnificent panorama will leave you with unforgettable memories. This course will give you the best sensations. Fans and enthusiasts can sharpen their swing there with a guaranteed favorite! Open daily, year round from 9:00 to 18:00, the Golf is now a place of Appointment friendly. One area that stretches almost 100 km and which culminates at 2500 meters. PAYOLLE: skiing station also located 15 minutes from the cottage. At the foot of the Col d'Aspin and the Pic du Midi, Payolle plateau offers spectacular scenery in an unspoilt mountain countryside. You who love to taste the pleasure of pristine snow, the Payolle resort is for you.